HomeHairComprehensive Hairfinity Reviews – Is It Worth The Money? As a woman, who wishes to look her best, you should understand that you would need to perfect all aspects of your appearance. Not only will you need to dress to impress, but also you should perfectly apply your makeup and immaculately style your hair. Unfortunately, some women and men have a difficult time trying to grow long, beautiful locks. If you’ve fallen into this category and wish to grow longer, fuller hair, you should consider purchasing and utilizing hair vitamin supplements. 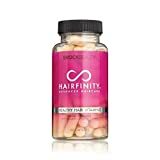 Within this comprehensive guide, you will be able to discover the truth about Hairfinity reviews. Is it worth the money? You’ll find out below. First and foremost, it is pertinent to remember that supplements must be utilized on a regular basis. Generally, the supplement pills must be taken several times per day, but the specifics depend precisely on the product in question. Some supplements will require the consumer to swallow 4 or 5 horse pills each day and this is truly not desirable. The good news is that Hairfinity is a much better alternative. The product can be taken 2 times each day. 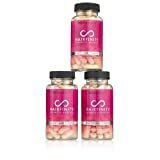 At the same time, Hairfinity is available in various quantities. The consumer can easily invest in a 1, 2 or 3-month supply. This helps the consumer save money, while also helping you avoid potentially hefty shipping fees from month to month. Of course, some women would do anything to be able to grow their hair longer and fully and this includes swallowing 4 or 5 pills daily. With this in mind, the performance and purpose of Hairfinity truly matters more than anything else. What precisely is the product capable of doing? Well, this product is specifically formulated with a variety of bioactive vitamins, nutrients and minerals. The combination is designed to help aid with the natural growth of the consumer’s hair. Although men could easily utilize it, it is intended for women, who desire to enhance the health and appear of their hair, without taking unnatural measures. The product is capable of rectifying a handful of problems, which may be negatively impacting your hair’s growth and appearance. This includes hair breakage and shedding. The markers behind Hairfinity believe that making the body a healthier environment will help to provide the hair with the vitamins and nutrients needed to grow and thrive. This is undoubtedly true, so the end result of consuming Hairfinity is the luxurious long locks that you’ve always dreamed of! When it comes down to it, there is an abundance of individuals, who would like to be able to grow fuller, longer hair. Most of these people are unwilling to utilize unnatural methods or swallow potentially unsafe products, in order to achieve this goal. This is where Hairfinity comes into the picture! The product is truly universal and can be utilized by anyone and everyone, who wants to grow their hair naturally. Below, you will find a list of people that should consider investing in and consuming this product regularly. Overall, the product is universal and can be used by everyone, regardless of his or her hairstyle or type. Although there are numerous similar products on the market, the majority of them are ineffective, because they ignore the user’s overall health. In order to obtain the results that are desired, you need to enhance your overall health and create a suitable environment for the growth of long, beautiful hair. Although it is sometimes possible to formulate a diet to achieve this goal, doing so is complicated and somewhat unrealistic. This is where Hairfinity truly excels. The product is capable of enhancing the consumer’s overall health, by providing them with the nutrients and minerals lacking from their traditional diet. All of the ingredients utilized in Hairfinity have been selected with precision to help enhance the user’s health, while producing a suitable environment for happy, healthy, thriving hair. 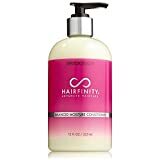 In this regard, Hairfinity starts on the inside and strengthens your body, while providing it with everything needed to grow those long locks you’ve always desired. 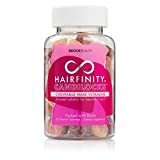 Hairfinity contains 2,500 mcg, which is a very important ingredient that plays a huge role in boosting new hair cell growth and preventing alopecia (hair loss). When taking this product, you will be receiving two benefits in one, since the biotin will also help strengthen your nails. Of course, this is only to name a few of the benefits that you will receive from this main ingredient. Biotin is actually classified as a vitamin B and coenzyme, while often being called a vitamin H constituent. Another wonderful ingredient in this supplement is Folic acid, which is responsible for boosting red blood cell growth. A deficiency of this important vitamin B can lead to severe anemia, which can be life threatening, if not treated properly. With 200 mcg of folic acid in two capsules, you could potentially decrease your risks of developing anemia at some point in your life. While, you can find this ingredient in a variety of vegetables and fruits, it is not always possible to consume the daily recommended dose. Well, you will not need to, if you take a daily regimen of Hairfinity. Hairfinity contains a blend of hydrolyzed collagen, which contains an array of amino acids or the building blocks of protein. This very important ingredient will enhance collagen in the body. While it is a derivative of cattle bone, it is processed in a manner that removes the calcium content, while keeping the amino acids secure. Not only is hydrolyzed collagen capable of boosting new skin cell growth, but it will strengthen nails and hair cells. One of the main causes of hair loss is vitamin B deficiency. Many individuals will suffer from the condition, without even realizing it. It is very difficult to combine all the necessary vitamins in your daily diet, which is why many individuals turn to vitamin supplements. If you are looking for a healthy way to grow your hair, without all of the harmful side effects, you should definitely consider adding this supplement to your daily regimen. As with any type of medication, if you are inconsistent with the dosage, you will not receive the maximum benefits of this supplement. It is crucial to follow the directions to a tee and never skip dosages. This could potentially alter the effectiveness drastically, even to the point that it is ineffective. Not many hair supplements are effective in helping individuals with dyed hair. Well, Hairfinity works very effectively on hair that has been treated. You must remember that hair growth starts in the hair follicle and protrudes upward until it reaches the surface of the skin. This product will help restore your hair to its natural appearance, while making each strand of hair stronger and healthier. When attempting to find a reliable supplement, which is capable of promoting hair growth, you should proceed with caution. This is the case, because some of these products will come with negative side effects. Although every individual can experience something different, when utilizing a supplement, it should be known that no previous users have reported experiencing any negative side effects, while utilizing Hairfinity. This is very reassuring and will help to guarantee that you’ll be able to achieve the goal that is desired, without risking unnecessary harm or danger. When taking Hairfinity, it is crucial to stay clear of other vitamin supplements. According to CDC, there are nearly 60,000 reported cases of vitamin toxicity, which can lead to a life-threatening situation. Be sure to take your time to research each vitamin and follow, but do not exceed the daily recommendations. Many of these vitamins are classified as fat-soluble, which means they will dissolve in body fat and remain stored inside of the body. These vitamins should only be taken as prescribed by a physician or per the United States Department of Agriculture. If you have any questions regarding vitamin intake, you should visit the USDA original website for more details. Thanks jessica for your “pictures review” ! As a whole, Hairfinity is a tremendously beneficial product. This should be evident, when scouring through the various Hairfinity reviews, since they’re generally positive. For your consideration, the product’s most notable benefits will be listed below. When it comes down to it, there is truly a lot to like about Hairfinity. The product is fairly inexpensive, incredibly effective and is capable of providing results to everyone, regardless of their ethnicity or hair type. To make matters even more compelling, the pills are minute in size, don’t taste horrible and only need to be taken twice a day. With this in mind, everyone that desires to kick-start the growth of his or her hair will definitely want to consider utilizing Hairfinity right away!